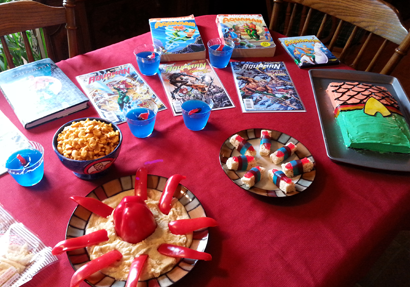 This Aqua-Party is the work of newest F.O.A.M.er Mark Burkett, who explains what we're seeing: "In the first attached photo you will see our themed food: A delicious hummus and pepper Topo, candy fish sushi, our friend Porm in blue Atlantean Jello, goldfish in a custom made Aquaman bowl, and lastly a delicious Aquaman cake moist enough to turn the most ardent Batman or Superman fan into a devoted disciple of Aquaman. 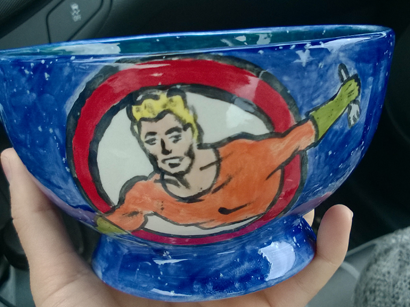 We then watched the hit 1967 Aquaman TV series and discussed the finer points of Aquaman lore." Sounds great, why wasn't I invited? Thanks Mark, and welcome to F.O.A.M.! Outrageous! This is just good parenting. Can we can some details on the candy fish sushi please? I'd love to do that for Aquaman's birthday next year! Haha, wow, that is just awesome! I love the Topo-dip. What fun! Mark Barkett here, so glad you like it! The candy sushi was made with rice crispy treats, topped with a Swedish fish, and wrapped with fruit by the foot.